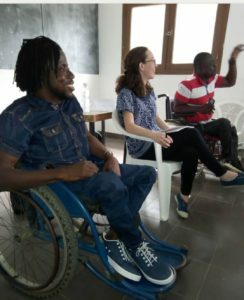 For over a decade, ICNC grantee Ahouty Kouakou and his colleagues from two civil society groups, Action & Humanisme and GIEHPCI, have been engaged in a nonviolent struggle for disability rights in Côte d'Ivoire, a small Francophone country in West Africa. Parting with the bleak Parisian winter last December, I thawed out during a three-day visit to the country’s economic capital, Abidjan, to meet several members of this incredibly inspiring movement. When asked why nonviolent action is effective for pushing for change, one of Ahouty's co-trainers piped up: "Because it doesn't break things! It only builds." This was just one of many moments that compelled me to conduct the following interview with Ahouty and his colleagues, which I hope will channel some of their wisdom and experience for you, Minds of the Movement readers. How would you describe the current context in Cote d’Ivoire? Cote d’Ivoire faced a long political crisis from 2002 to 2010. This crisis created mistrust and violent conflicts between supporters of former president, Laurent Gbagbo, and Alassane Ouattara, the current president of the country. Since then, we have experienced bloody conflicts between peasants and pastoralists (shepherds), land conflicts, intercommunity conflicts. In January, the International Criminal Court (ICC) announced that Laurent Gbagbo, who had been detained on charges of crimes against humanity allegedly committed during post-2010 election violence, was acquitted because of insufficient proof. The ICC’s decision provoked anger among Ouattara supporters, and violence has resumed between the two groups. The horizon is dark because in 2020 we will have another presidential election. Ouattara wants to stay in power despite the fact that our constitution does not allow a third term. I fear a violent post-election crisis like the one in 2010. The nonviolent struggle for disability rights in Cote d’Ivoire dates back as early as 2004. How did it all start? In 2004, a group of handicapped students was arrested and detained by SOTRA (Société de Transport Abidjanaise) police officers because they refused to pay bus fare. The activists were citing a law called “Loi d’orientation en faveur des personnes handicapées de 1998”, which allows them to take buses free of charge. In protest, and to push SOTRA police officers to release their comrades, disabled students blocked roads to prevent bus drivers from advancing. The situation created a monstrous traffic jam. As a result, the director of SOTRA decided to allow handicapped persons to ride free of charge, and this is still the case today. Has the struggle seen any recent successes? A few years ago, in December 2014, handicapped persons organized a mass sit-in at the presidential palace in the business district, Plateau, to protest poor living conditions and demand decent jobs. Although the action was repressed by the police, it ended up forcing the government to adopt an exceptional decree to recruit 300 handicapped persons for jobs in public administration. Later on, in 2017, the group organized another movement that led the recruitment of 158 handicapped persons last year to work in the public administration. Also in 2017, university and private school students carried out a sit-in to protest the delay in delivering their diploma. In response to the pressure, the Ministry of Education delivered their diplomas. Since then, there has not been delay in delivering diplomas. How do you talk about nonviolent action with people who are not familiar with it? Group meeting in Abidjan including civil society leaders and disability rights activists. December 2018. Many people’s initial reaction is to not believe that nonviolent action is effective. But sometimes all it takes to change their minds is describing examples of methods. Nonviolent action isn’t some ideal or attitude or policy; it’s blocking a bridge and causing a major disruption so people in power have no choice but to listen to you and invite you to the negotiating table. I’ve come to realize that most of the people who are initially receptive to the effectiveness of nonviolent action are those who have already witnessed or been part of a failed violent uprising. Why should people learn about nonviolent action? Teaching people about nonviolent action is important because it opens our minds up to how society could work better. It doesn’t have to be unjust. It doesn’t have to exclude certain groups of people. Nonviolent action should also be taught because violence gives authorities a reason to crack down on protesters—and that’s granting the authorities exactly what they want. Nonviolent action denies them this. Plus, nonviolent action does not destroy; it allows us to preserve what we’ve built and acquired, while still taking action to change the status quo. What strategic guidance would you offer nonviolent activists in other countries? Invite international media to report on your planned actions. In our experience, national media will ask for money to report on actions, while international media are less likely to. International media also constitute a powerful means to put pressure on decision makers to satisfy protesters’ demand. In addition, media help movements link up with potential allies and supporters by mobilizing the international community around protesters’ causes. Also, educate the public about nonviolent action, adapting your pedagogy to your audience. For example, university students are used to thinking about theory, whereas with non-academic audiences, it’s important to start with concrete examples from history or modern times. What’s next for the Ivoirian movement for disability rights? We’re still here! We were doing this before we got in touch with ICNC, and we’ll keep doing this even if we ever lose touch with ICNC. Note: Parts of this interview were conducted in French and then translated and edited for clarity. 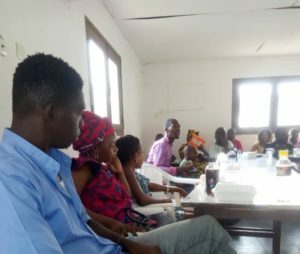 Featured image: ICNC grantee Ahouty Kouakou and Action & Humanisme colleagues who are engaged in a nonviolent struggle for disability rights in Côte d'Ivoire, December 2018 (photo with ICNC envoy Amber French). 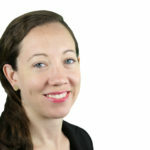 Amber French is Editorial Advisor at ICNC, where she launched and now manages ICNC Press and its acclaimed Monograph series. Amber led the development of the Nonviolent Conflict News site (NVCNews.org) and of the Minds of the Movement blog, for which she is now co-editor.